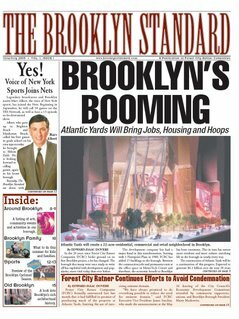 Remember the Brooklyn Standard? It was supposed to be published way more often. Forest City Ratner Companies (FCRC), the developer of the Atlantic Yards project over the Long Island Rail Road yard at the intersection of Atlantic and Flatbush Avenues, today announced the publication of The Brooklyn Standard, a periodic publication providing updates on the project and information about other relevant news and events in the borough. 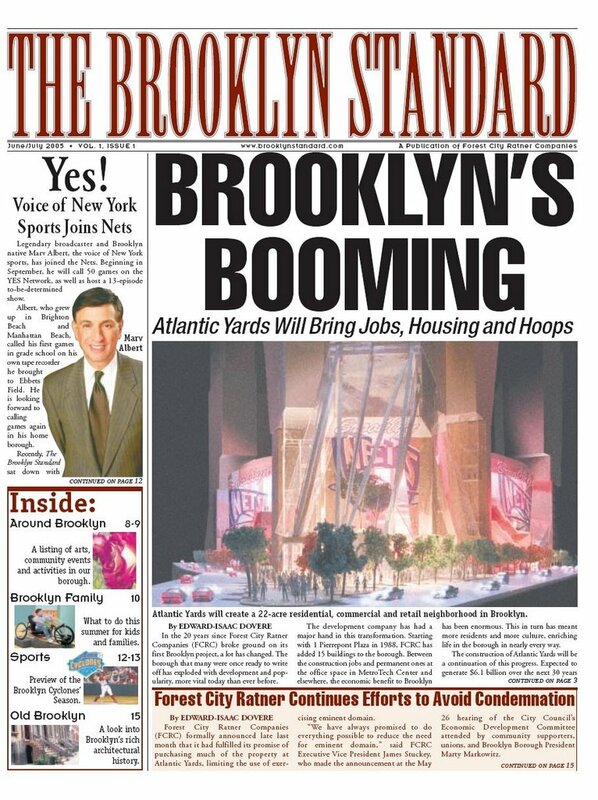 “We want The Brooklyn Standard to be informative and to the point on issues related to the Atlantic Yards project,” Bruce Bender, the FCRC executive vice president for government and public affairs. “Every few months we will put out a new issue with updates, summaries of meetings, up-coming events and even other activities throughout the borough that people may find interesting. Of course, that was before the New York Times belatedly trashed the first issue and the second issue, released in October 2005, faced criticism of its content and reports that it falsely attributed bylines to a stringer. The second issue was never mounted on the web, and no further issue never appeared, so the publisher never printed corrections requested by the stringer cited above. As demolitions are planned, the developer has found new avenues--press releases and a Community Liaison Office--to present some calibrated doses of information. The Community Liaison Office, however, has met with widespread criticism, from community groups such as the Council of Brooklyn Neighborhoods and even in the Brooklyn Daily Eagle, which reported 5/1/07 that "whenever this reporter has called that number, only an answering machine is heard." Now we have the annual Brooklyn Tomorrow, produced not by Manhattan Media for Forest City Ratner but by the New York Post's Community Newspaper Group (aka Courier-Life) for... well, the advertisers, who most prominently include Forest City Ratner and Barclays Capital. The tabloid appears in each edition of this week's Courier-Life issues, as well. Consider it another adjustment in the "Atlantic Yards permanent campaign." As Lumi Rolley of NoLandGrab wrote: Who needs a fake tabloid when the Post will do it for you?